Michael Moore has just released a movie, and I’m starting to hear the same nonsense about him that I heard about im last time he released a movie. Note that in the sentence previous, “nonsense” is a euphemism for something else less polite. Anyway, while I have not yet seen the new…”product,” I have seen the previous one so I thought I would jot down some of my observations about what doesn’t quite make sense here. Last time I heard that, a lot of the interesting facts (or good points) went up in smoke shortly after the movie came out. The notion that Moore is full of crap, continues to endure. And yet, here we are again. Michael Moore’s new movie is now potent ammunition. For winning converts to his side. From out of “moderate” Ameirca, not from out of your local Socialist club or your annual YearlyKOS get-together. From out of the heartland; among people who know about Moore’s predilection, and his intent, to deceive. Now I’m thinking: You could say the same thing about Dr. Laura Schlessinger, couldn’t you? I mean, this is problematic in some areas: It is mostly a subjective system of individual belief that she is full of crap — some agree with that, some disagree. Whereas Michael Moore being full of crap, is a fact that can be proven to anyone who takes the time to pay attention and to give the viewpoint a decent hearing. Apart from that, you could say the same thing about Dr. Laura. Or Sean Hannity. Or Laura Ingraham. Or Condoleeza Rice. Or President Bush. I don’t think the Michael Moore fans, or the prospective Michael Moore converts, are going to be doing that. Our national culture seems to have settled into the comfort-zone that with most personalities, logic, truth and integrity take on the form of a fragile sweater: One thread comes apart, it’s just a matter of time before the entire article is undone. It isn’t necessary to prove an intent to deceive. It isn’t even necessary to substantiate the error. Personal disagreement will do: He thinks there is a God, so he must be an idiot. He is, in his own way, a genius. And this is an even bigger problem from where I sit: If Moore’s competence was limited, then it could be said if he mananages to make something look a certain way, there would have to be a measurable grain of truth behind it. As it is, Moore’s level of skill is such that when he makes a thing look a certain way, this means butkus. He has the talent needed to make anything look like anything. People understand this to be so…and yet when he says something is the way he presents it, people continue to believe him. This is the part I don’t understand about Michael Moore. We can survive Moore. I don’t think we can survive the scales that encrust our eyes when he comes out with his “products.” So many of us know a certain thing is so, and behave as if it isn’t. So — he’d like us all to ponder the notion of a single-payer healthcare system in the United States, is that it? Here’s another thing I’d like explained. Why does Moore have anything to do with America? Every time he comes out with a movie he keeps returning to his “Bowling For Columbine” theme that there is something wrong with America, something rotten in its core — something that compels us to be afraid of things and shoot each other all the time. He makes his films in Canada. He claims to be from Flint, MI — not too much of a drive to go from there, into Canada, for good. I’m not saying it to be derisive or dismissive — watch his movies sometime. Any one. The dude really likes Canada, and I don’t know of a single good thing he’s had to say about the U.S. by comparison. What’s he doing here? Yet another thing to ponder, is Moore’s impressive physical stature. He wants us to listen to him. He wants to influence. He wants to have an effect on what we do. When people tell me things about physical health, and medicine, I’m persuaded to listen to them when they show me this is a personal passion of theirs. Jack La Lanne. Denise Austin. And I don’t think I’m unusual that way…people tell me how to maintain my body, I want to know how they’ve been maintaining theirs. 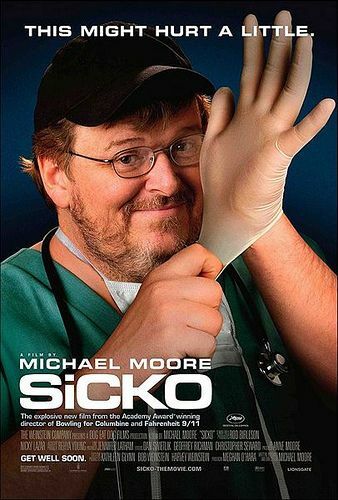 Why’s this grossly-overweight guy making a movie about our health care system? Why is he even using is big multi-chinned face to decorate the cover? And how come, after apparently doing exactly what Michael Moore wants done on a federal level, Wisconsin doesn’t have any enviable results to show us? I’m going to want to see this movie as soon as I can. I hope those questions are all addressed to my satisfaction. I’m also going to want to know about food. I’m told healthcare “oughtta be a right” because people need it. People need food too. And working transportation. And I wouldn’t mind being spared the hassle of sniffing my milk to make sure it’s still good, keeping my freezer full, and keeping my car running. If I’m to be the beneficiary of a nanny-state government that will worry about my burst appendix and my hangnails so I don’t have to, then I also want a government that will give me three hots a day and buy me a car. No, I’m not kidding, I’m completely serious. I’ve yet to hear a compelling argument why one thing should be a “right,” and the other things ought not be. Very well said, my friend. This goes on the front page of NBC as soon as I can get it there. You’re obviously a thoughtful person, and so if you have yet to hear a compelling argument about why health care should be coordinated as a pooled resource rather than as several competing capitals… I hesitate to say this because I don’t want to sound disrespectful… I hope you do know about the different types of economic goods. (private goods, public goods, club or toll goods, common pool resources, there are lots of ways to slice and dice it… the wikipedia page on types of goods has a fair list of them). Three hots and a car are all private goods, and and most efficiently provided by free market mechanisms, the story would go. Healthcare is a complex area that includes some private goods, common pool resources, public goods and club goods. On the whole, the club and public good elements are the biggest components, the story would go. Hence, some degree of centralization of command and resourcing would produce greater efficiencies. You may disagree with all this, but this is the direction in which arguments that are compelling to some people might be given. Say we privatize all security. No more army or police, only security companies with operations of various scales, and various brokerage firms that negotiated contracts with clients and client groups. Could such a network mobilize globally instantly, as a state military could in theory? The transaction costs of negotiating payment for sudden actions would be astronomical, given the opportunity costs of lost time when time is that crucial. Military action (not insurgency, quite so much, but conventional warfare) has required the pooling of resources and centralization of command since before money was invented. The military needs to be a “firm” (according to the transaction theory of the firm), it needs to be organized so the transactions within the firm are millions of times more efficient than external market transactions would be. Consider a health system entirely structured around patients purchasing personal services from doctors with the help of insurance plans. Now suppose a drug-resistant strain of TB emerges in the uninsured population. Your doctor, to protect *your* health most efficiently, should actually head into the uninsured population and participate in the containment of that outbreak as soon as possible. Say a resurgent SARS or some other new viral epidemic emerges in Asia. The most economically efficient way of preserving your health is to contain the illness in Asia, and treat people there with all the resources necessary, barring no expense because the expense of waiting until you start to sniffle and then go see your doctor would be astronomical. So, when your doctor goes to do these things, to protect your health, should she or he send you a bill? The thing is, while protecting you, the doctor is protecting ALL AMERICANS. It’s a public good, and the bill should go to the beneficiary – everyone. It is hard to see how a market based system based solely on patient-doctor appointments would produce this particular public good. And this is just one layer of the onion. It can be argued that the costs of competition and marketing between capitals add cost centers to the healthcare system that end up wasting the national investment in healthcare, and a single-payer system does away with these costs. And there are tons and tons of points like this that would make up the full, entire “compelling argument”. While compelling to some, it might still be wrong, but this is the way it might start to unfold, for people serious about understanding this debate. Glad to have you aboard. This is exactly the kind of post we like to see here: Different viewpoint, support for the argument that actually leads to something that can be researched. Well done. Health care, as you point out, is a complex field that covers many different classes of good. All four of the main ones, it would seem: Common pool resources, public goods, private goods, club goods. The private goods like bread and petroleum, have it in common with the pool resources that these are rivalrous goods. I put some gas in my car, and this is a volume of gas no longer available to you. One of the big problems with soclializing commodities we’ve seen over the generations, is that it deprives the market of the signalling mechanism afforded by a capitalistic system. If a rivalrous good is privatized and a shortage of that good is coming, the market reacts to the shortage with no small amount of foresight. A bad wheat harvest, and your loaves of bread double in price. This is painful, but it’s a good pain because it’s an incremental pain. People pay a dime over last year, then fifty cents, then a couple of dollars. Meanwhile, they plan for it. Sandwiches lose their appeal as a traditional staple food when times are lean. Nobody’s whistlin’ dixie on their way to a huge warehouse to get some bread, only to be slapped in the face by reality when the warehouse is empty. They’ve had all season to understand that bread is becoming scarce, and to plan accordingly. Socialism ends up being “dumb,” as you point out yourself, with regard to the rivalrous goods because these scenes continue to play out like Soylent Green. With the disposal of capitalism, the market loses it’s ability to look ahead. Now I haven’t seen the movie, but here’s what’s rattling around in the back of my head: What makes these commodities dumb things to socialize, is this “rivalrous” attribute. And a commodity is rivalrous when it is exhaustible. I put bread in my pantry, I’m not depriving you of the loaf of bread, quite so much as the square feet of wheat field for that season that were used to grow it…and a timeshare of the machines that were used to grind it, mix it and bake it. Is health care not every bit as exhaustible? It seems certain, in both socialized and privatized markets, it can be depleted. That’s the whole problem. This has long been my whole problem with socialism. It comes about because of public agitation, and the public agitation is inspired with regard to commodities that are socialized as a prelude to further public grief. This-or-that thing, whether it’s a club good, private good, public good, whatever…there’s an overwhelming populist sense that it “ought to be available to anyone who needs it.” And along comes socialism to ensure that it is NOT. Another problem with socialism is that it’s an inherent absolute. The populist outcry is for increments; a “little dab” of socialism where there is none, a bigger dab where there is some. But the populist outcry never seems to diminish until the socialist enveloping is complete. I would say the United States itself is a great example of what I’m talking about here. We have our programs that tax the consumers and income-earners, that kick in when other taxing programs are said to have failed. We have multiple layers. 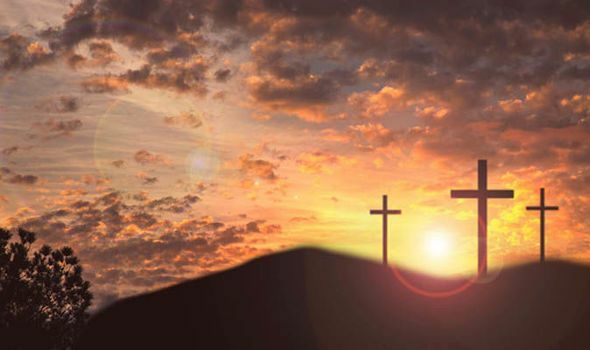 Where are our armies of lepers dying in the gutters? We don’t have those — and we don’t have all of the consumer choices that a pure market-driven economy would have. We’re a pretty far cry from a “Galt’s Gulch” here, especially with regard to health care. And yet, the populist outcry continues to crescendo like never before. Not through reason or common sense either. As I pointed out, this summer our national spokesman on the subject of health care, is a big fat disgusting movie maker who nobody thinks tells the complete truth about anything, and who nobody thinks eats properly or exercises properly. And this isn’t because America is an unreasonable Birch Society capitalist paradise teetering on the brink of abolishing it’s fire halls or Departments of Transportation. It’s because America is not a 100% socialist utopia YET. Socialism always wants more and more. It’s the Terminator robot of economic models. I do have some thoughts in response to those you have offered. Several, but I’ll start with one here. As you are very likely already aware, Aristotle has described three rhetorical appeals in public discourse, logos, pathos and ethos. A lot of the public debate around Sicko leans heavily and pathos, but you and I appear to have chosen differently. Aristotle divided the logos appeal into four categories: syllogism, maxim, example and enthymeme. Logos-rooted discourse consists of these appeals. Some of your maxims about “socialism” strike me as more theory-generated or reasoning generated than example-based. You talk about socialism being “an inherent absolute”, always wanting “more and more”, the “Terminator robot of economic models”. I appreciate that these are flourishes meant to crystalize your enthymemes, and I grant you the poetic licence you exercise in framing them. I adress the point they illustrate. I do not see any necessary historical connection between the nationalization of healthcare and state socialism on the Bolshevik or Stalinist model. I view the matter somewhat differently, having lived or spent significant amounts of time in Canada, Denmark, India, South Korea and in the Czech Republic in the years shortly after its state-socialist regime crumbled there. State-socialism was awful across that whole region! 40 years of stupidity and destruction. It is hard for me to see anything at all in Canada or Denmark that indicates any movement towards that state socialist nightmare, though. Ditto for the UK. But this division between captialism and socialism as two opposing “teams” does not seem to square with certain very salient examples today. I’ve named the examples of societies I have experienced, but the most obvious and important example is actually China. It is a Stalinist state in every sense of the term that has found it expedient to leverage the efficiency of free markets in commodities. So their economy mixes state-socialist collectivized production and free-market capitalism (which they are getting good at…) governed by a mix of one-party dictatorship and sheer anarchy. Elements and aspects of each economic mode are being blended in so many ways in so many countries that I cannot see them as opposites that must characterize a national economy wholesale one way or the other. That simply is not what I see happening in the world. And I get no sense that any of these countries are moving “inexorably” towards a pure form of either all-state-directed or all-free-market economic activity. It seems to me that national economies are mobilizing a mix of governance mechanisms to deliver a mix of goods, and that pure forms do not exist. Even if you try to stamp out the free market, it will persist as a black market, and if you managed to get a state-free society, people would form coalitions and pool resources, appointing able governors of the pool in order to ensure the production of certain goods that need central direction. E.g. the emergence of civilization in Mesopotamia had a lot to do with people rising into positions of power because they had the social legitimacy to coordinate many landowners into sacrificing land and labor to lay down area-wide irrigation systems. So I offer those examples and so on, in opposition to your maxims about socialism. That said, I want to agree with your observation about people and their constant cry for more support from the Ur-parent. I see it. Yes, people who are whiners of this sort are attracted to certain social causes. The reasonableness of the causes does not depend on the reasonable of whiners, however. Or levelers. There is a strong leveling urge in people who are attracted to social justice causes. These people think it is immoral for Bill Gates to have so much, and for millions to be starving. They have no sense that allowing people to produce wealth and become rich makes a bigger pie for all to share, and instead they feel the urge to make everyone take the same-sized share out of the pie, even if the whole pie shrinks drastically for all. THis is idiocy, and I think a lot of it comes from a consumer mentality. People think of money only as a signal of how much you are able or allowed to consume. These people typically have never run a business, and do not understand the *productive* face of wealth, and why it needs to be directed towards optimally productive uses given supplies and demand, with the economic signal value that ensues, which you have highlighted in your development of the “bread production” example. I personally do not move from these ignorant and distressed behaviors to a condemnation of the pooling of resources and centralization of decision-making power, because sometimes it makes sense for a coalition of people to do that. Instead, I basically take an evolutionary psychology view of such people. They have some simple symmetry-seeking and fairness-seeking modules in their brains that are “firing” on the stimulus of a social justice issue. That is fine, and they are free to emote, but it is separate from the question of how to best produce a given good under given circumstances. I don’t want to let my disdain for the one cloud my understanding of the other. There is another important distinction to maintain, which is that between coalition economics and bureaucratic organizations. It may very well be that a good needs to be produced through pooled resources and centrally directed production, but that the existing organization with a mandate to accomplish that goal is bureaucratic, inefficient, disorganized and mismanaged. It may be that they are too buffered from market forces or democratic oversight or other important forms of institutional discipline. These are serious questions of institutional economics. I think it is wrong to conflate these institutional problems with the core economics of the production of goods though. Institutional inefficiency is one question, and coalition economics are another. Of course, as soon as you decide to pool resources, the institutional questions rise full-force, so in practice they are intimately related enough to be considered always “in the same breath”. Confusion ensues when you forget that they are distinct however, I believe. I’d like also to respond to your introduction of the concept of economic signaling through the price mechanism, but that will have to wait a bit. This entry is already so huge!! But I wanted to situate myself a bit more in the morass of political, economic, institutional and social-psychological issues surrounding the core question of goods and prices. I must thank you for engaging all this writing, and for thinking about the level of the sound bite!! My experiences with the UK’s NHS were OK, but those of my neighbors and friends were certainly NOT. Horror stories were rampant. And if you’ve ever had the occasion to watch “PM’s Question Time” on C-SPAN, you can hardly fail to notice the first ten minutes of each and every session is consumed with complaints about the NHS…usually from “across the aisle,” but complaints, none the less. And some of those complaints I’ve heard have indeed been “horror stories.” I’d sure hate to see that sort of system implemented in the US. A “single-payer” health care system just isn’t the answer, as I understand the arguments for it. My $0.02.